Attention all nail addicts I've got something super cool to share with you if you aren't already in the know. Right now nail art is HUGE and if you are like me it's a joke to even try to achieve something at home and heading to a nail salon to let the pros do it is NOT cheap. Solution? 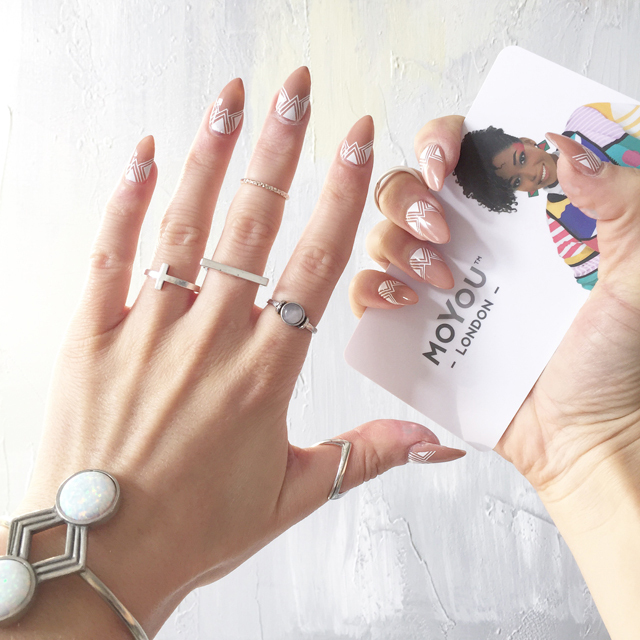 MoYou London nail stencils. What's funny is these guys have been on my radar since last Spring. I was at a media preview where we got spoiled with mani's and the girl I got had these stencils. Within seconds my mind was blown and I couldn't wait to look them up when I got home. Fast forward to the present and I got an opportunity to work with Trade Secrets, who just started carrying MoYou AND the only place in Canada for that matter, so obviously I was pretty jazzed to hop on board with this partnership. I got two stencils to play around with: Holy Shapes and Mandala. The Holy Shapes stencil came in a Starter Pack which I highly recommend getting because in it you get a scraper, stamper and a polish. Here's the rundown if you are confused, basically you get plates with intricate designs, you put your favourite polish colour over the design, you scrap off the excess leaving polish in all the detailed areas then you stamp the area which transfers the polish onto your stamp and you roll the stamp over your nail leaving crazy, fun designs. Nuts right? Beware this does become addictive! I admit it looks easier than it really is BUT once I did get it the process became a lot quicker. The most difficult part for me was finding the right pressure when transferring the polish from the stencil to the stamper. Once I found the sweet spot I was good to go! See the steps below or watch the video if you are still confused. It is pretty mind blowing and hard to believe something so simple exist. Read further for my tips and giveaway details. Tips for Application: Be generous with the amount of polish you dab on the design to ensure it reaches all nooks and crannies. When scraping hold it at a 45 degree angle. When transferring onto stamp do it in a fluid rolling motion and practice until you find that perfect pressure. 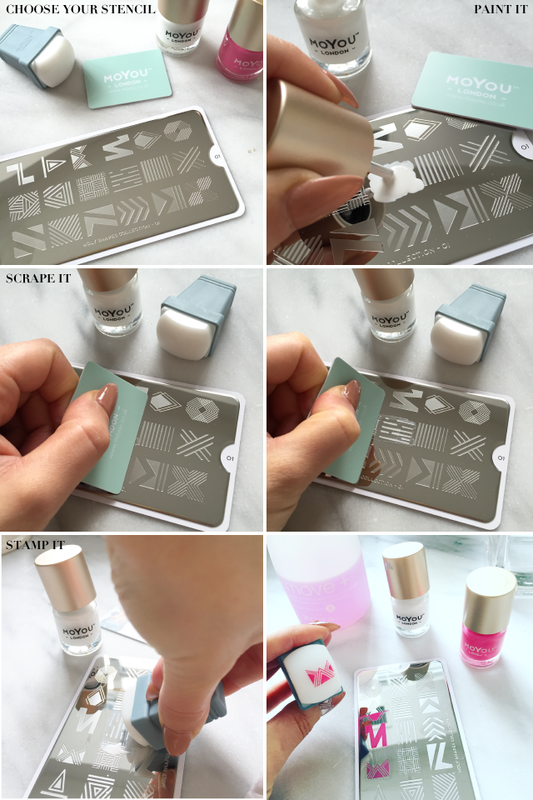 You will do the same as you stamp it to your nail. Tips for cleaning: Things to have handy because this can get messy is nail polish remover, cotton pads, a lint roller and a makeup brush. After each application you want to clean your plate, scraper and stamp. Rub all three with the nail polish remover until clean then again to remove excess remover. The stamp is quite sticky so fuzzies transfer easily but I recommend stamping a lint roller, it works like a charm. Tips for nail polishes: Personally I get my nails done every week and use shellac. Shellac is going to be your best friend when using these because if you mess up on a nail you aren't removing your base colour just the design. As for the polish you are using for the design part I do recommend the MoYou London polishes because they are highly pigmented and designed specifically for the job. After you have completed your designs you want to finish off with a top coat and my absolute favourite is Seche Vite Dry Fast Top Coat. GIVEAWAY: Head over to my instagram NOW. To enter all you need to do is follow @trendstruck, follow @trade_glamoursecrets and tag a friend in the image who you think would love these too! For an additional entry repost my image and tag me! This giveaway is open to Canadian residents only and will close on Monday December 14th at 12pm EST. Good luck and I hope you love these as much as I do! So cute! And great review! wow love the review wants! you have impeccable taste! gorg! xO!